When Trevor Bauer last found himself on the mound with a chance to close out a playoff series, nerves got the better of him. With a championship up for grabs on Sunday, the D-backs prospect didn't make the same mistake twice. The third overall pick in this year's Draft struck out seven over five innings as the Mobile BayBears won the second Southern League title in franchise history with a 6-4 victory over the Tennessee Smokies. "It's pretty awesome," said Bauer (1-1), who surrendered seven runs over three innings in Game 4 of the South Division finals. "I joined this team late, so I wanted to go out there and contribute and help the guys that have been working hard all year for this moment. "I wasn't nervous, I don't get nervous anymore. I've been playing this game a long time. It's the same game once you step between the white lines. Balls are hit and runs are scored." Bauer's lone blemish on Sunday was Jae-Hoon Ha's two-out solo homer in the first inning. But the BayBears scored a pair of runs in the second and four more in the sixth to give the 20-year-old right-hander all the support he needed. "I think I located better tonight. I put in a lot of work this week to make sure I put it where I wanted it -- inside, outside, wherever," said Bauer, who was 1-2 with a 5.96 ERA in seven regular-season starts between Visalia and Mobile. Tennessee made things interesting with a three-run seventh, but the BayBears -- who cruised to the second-half South Division title -- closed it out as Evan Marshall struck out Ha to set off a somewhat muted celebration. "You never know, not until that last out is recorded," Bauer said of watching from the dugout. "They had the tying run at the plate, so a bloop and a blast and we would have lost. It didn't sink in until we all ran on the field. "There wasn't a dogpile, but there was a lot of jumping and spraying champagne. I couldn't drink any because I'm only 20, but it was still a lot of fun to share that moment with the players and coaches. Hopefully, I get to finish the season watching the Diamondbacks win a championship." 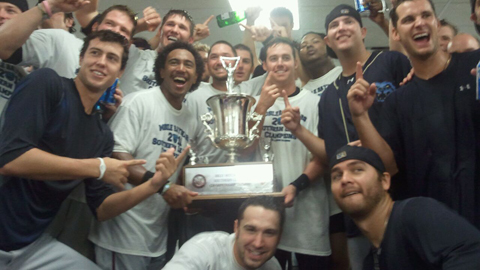 The championship was the BayBears' first since 2004, when they shared the crown with the Smokies in the wake of Hurricane Ivan. Mobile's only outright title came in 1998 when the team won a record 86 games. "It's just a feeling of relief, knowing this is what we set out for from day one," said BayBears first-year manager Turner Ward, a Mobile native. "Whether it's my first year or 10th year, what makes this more special is that this is my hometown." Bauer's batterymate, Josh Ford, had half of Mobile's six hits in the clincher. The former ninth-round pick homered and scored twice, while Matt Davidson smacked a solo shot. The BayBears featured former first-round picks in Bauer, fellow pitchers Tyler Skaggs and Jarrod Parker, outfielder A.J. Pollock and third baseman Matt Davidson. Paul Goldschmidt contributed 30 homers and 94 RBIs before he was called up by the Diamondbacks in August. "There have been so many contributors. It was such a team effort," Ward said. "A.J. Pollock scored over 100 runs and batted over .300, and Adam Eaton and Ryan Wheeler were mainstays the whole year. I can go on and on about who contributed. Patrick Corbin led the league in strikeouts and Jarrod Parker won 10 games. "There were so many people. Saying it was just one person would do an injustice to the team." Trey McNutt (1-1) lasted 4 1/3 innings for Tennessee, which was making its third straight appearance in the Championship Series. The Cubs' No. 4 prospect gave up two runs on two hits and four walks while striking out three.